Below is a remarkable 7 minute video that has been doing the rounds on Facebook, made and broadcast by Gilets Jaunes member Roman Light, whose Facebook account can be found here. We also recommend this one-hour interview he did recently with Jason Liosatos for Outside the Box, Yellow Vests Protests France Interview with Roman Light Gilets Jaunes. This young, articulate Frenchman delivers a very clear message about what the Gilets Jaunes (or Yellow Vest) movement is all about. Below is a summary. Regardless of what we’ve heard, it’s not about a particular issue as much as it’s about ‘one essential aspect of our so-called democracy, which is that illusion that our voice has meaning.’ Remember Black Lives Matter? This is about people’s voices matter. We’ve been programmed to think that it’s enough to have our representatives speak for us. But the political class doesn’t care what we think. 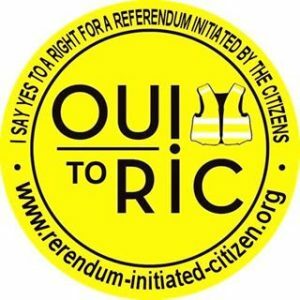 In France we’re looking for a remedy to this … the RIC, the citizen-initiated referendum. We’ve had enough of the political class telling us what to do and what to think, and that this way is better for us. We don’t want rulers; we want to be sovereign, making our own decisions. This little idea is an earthquake that could go across the world, a veritable tsunami which inspires people. We are responsible for this sorry state of affairs and everything that goes with it. We’re losing ourselves, our souls, we’ve become an instrument of production and have lost all connection with nature and ourselves. There’s no point in complaining if we don’t act. We are responsible. The (French) Constitution doesn’t give us a right to trigger our own referenda. This is a key element of our slavery. A citizen-initiated referendum needs to be written into the Constitution. We’re not protesting about taxes or inequality or anything like that: we’re protesting about our own powerlessness. We are powerless and we’re done with that, with people telling us what to do. And we want to learn from our own mistakes. People in power will still have to make decisions, but they must be accountable for what they do. A small percentage of a country’s population should be able to trigger a referendum on anything that affects our lives whether it’s to do with finances, politics, health, education or foreign policy, etc. We’re done begging to be listened to. The Yellow Vest is the color of hope, a symbol of light in the darkness, a language for the world to stand up and say ‘enough is enough’. We’ve had enough listening to you; now we’re going to IMPOSE what we want to happen. France is showing the way, but we need to do it together.